Chandler has been fortunate to develop a relationship with UT Southwestern, one the most respected medical institutions in the America. Originally tasked to place exterior signage on 7 buildings on its campus, including the major identifier high-rise signage, the relationship evolved into developing UT Southwestern’s newest campus at William P. Clements Jr. University Hospital. Involving both interior and exterior signage, the project centered around two sets of major identifier signage along key thoroughfares; the entrance and a major highway. 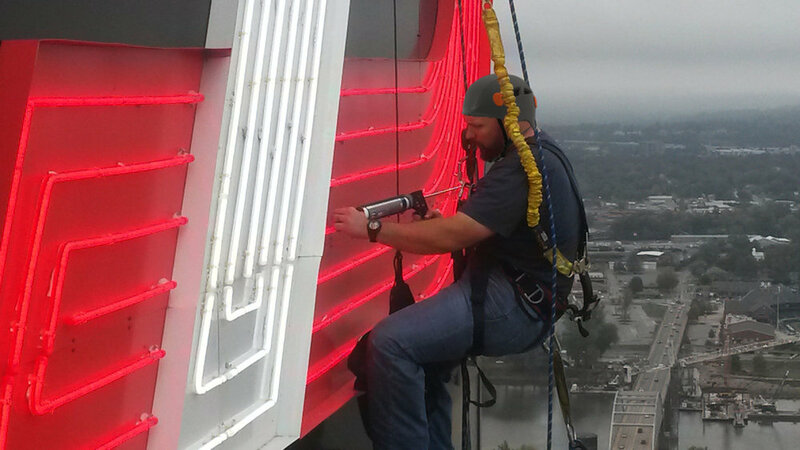 The identifier letters are 9-feet tall and span 106 feet across the front façade. The challenge was to construct a steel support structure that could still remain invisible. Our Chandler Project Management team led the process along with multiple engineers, hospital administration staff and architects. All aspects of signage were designed by Chandler, which included directional signage, emergency and ambulance entrances and parking control signage. Chandler continues to be involved in the growth at UT Southwestern and is now working on the next phase of their new campus and additional medical facilities.